Depression, Bipolar and Guilt! Oh My! I feel guilty. Very guilty. What do I feel guilty for? That’s easy…damn near everything. Anybody who’s been depressed can tell you that feelings of guilt and self-blame can be overwhelming. 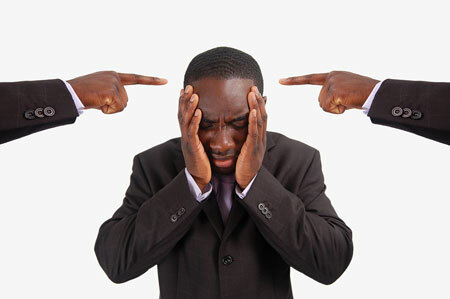 In fact, the tendency to blame oneself excessively (and inappropriately) is a key factor in depression. It’s a vicious cycle. Depression leads to guilt, which leads to feeling further depressed, leading to further guilt, leading to….You get the idea. I’ve felt guilty for minor things throughout my life. I sometimes will feel bad for things I’ve said over 20 years ago, knowing full well the other person has probably forgotten about the moment a long time ago. There’s plenty of things that I’ve said or done over the years that I’m not too proud of. People I’ve hurt because of my alcoholism, not spending time with my daughter, spending money I didn’t have and not being able to pay it back. These are all things that I believe would make most people feel some guilt, but I don’t ever feel “some” guilt. I am “consumed” by it. When I talk with my pdoc and my therapist about past indiscretions, both of them remind me that those actions were caused by a Bradley who no longer exists. Those actions were caused by the undiagnosed, unmedicated Bradley of long ago. Today’s Bradley is more balanced. Today’s Bradley uses better judgment. Today’s Bradley is better than yesterday’s Bradley. When I’m in their offices it makes complete sense. It makes me better at accepting myself and it makes me proud to be who I am today. Those feelings of forgiving myself are very strong – until about an hour after I walk out their doors. Once the feelings come back, they flood my brain with guilt and shame once again. In very simple terms, that even I can understand, they had two separate groups of students. One group was made up of students who have suffered from depression. The other group, obviously, did not suffer from depression. Each student was given statements to read that could cause guilt and they read those statements as they were undergoing MRI scans. Now, because I’ve suffered from seizure,s I’ve had to undergo more MRI’s than I can count. I can’t imagine having to read while having one done, but apparently they found students who could. Here is the interesting part. Each of the two groups read the statements and both resulted in firings in two parts of the brain. One part of the brain involves socially appropriate behavior and the other involves feelings of guilt. In both groups the firings in the brain occurred simultaneously. However, in the group that had not been depressed firings occurred which connected the two parts together, like a bridge. In the group of people who had suffered from depression, no bridge existed. Both sides of the brain reacted simultaneously, but were independent of each other. What does all this mean? I have no clue and neither do the doctors. Currently they are trying to determine the chicken and the egg questions – whether depression causes these brain differences to develop, or the brain differences lead to the development of depression. Either outcome could lead to further understanding how depression works and hopefully, lead to more effective ways to combat it. How does this affect me? (Of course, you know it always has to be about me) As a person who thrives on guilt, I hope and pray for the day that a “cure” is found to eradicate both depression and bipolar disorder. Most of my guilt comes from relying on people who’ve cared for me back before I was properly medicated. This is especially true regarding Maurice. I am grateful for all the time he cared for me when things were at their worst. On several occasions he had to drop everything he was doing and come find me because I would be lost and wandering around. Now he continues to care for me because of physical problems I’m having. I currently have a case of severe radiculitis, meaning I have swollen disks in my neck that are pressing on my nerves which cause shooting extreme pain running down my right arm. I won’t be able to see a surgeon until March, so until then Maurice is taking care of everything. He works about 10 hours a day…I’m on disability. I can’t wash dishes, he does. I can’t do laundry, he does. I can’t fold clothes, he does. I feel helpless and guilty. He keeps telling me to stop feeling guilty, but that’s been a real struggle for me. Now, at least I understand why I likely am consumed with so much guilt. I only wish that understanding brought relief. Do you also become riddled with guilt, as well? If so, what usually triggers it? Does this possible explanation bring any relief? My guilt and shame. resulting from so many different occurrences in my life, cause me unrelenting shame and regret. I was diagnosed with bipolar disorder type 1 when I was 47, a year before my marriage ended after I had an affair. My recovery was very difficult, and I experienced harder times than I had ever had, eventually failing to make it in my legal career and getting on disability. Over the years I have disclosed my illness to anyone who would listen. I suppose in part I wanted to explain my failures and obtain sympathy. I had a great sense of inadequacy, an abiding fear that I was not good enough. Most of all I was afraid. I don’t know if anyone else has had this reaction. I feel a great deal of shame that I could not be stronger and manage independently. I often feel that I am a burden to others and that nobody understands. I also know that others are simply going about their lives and that I am just one small person. I am trying to be stronger. Morning Bradley, interesting take by navigator 1965! As for guilt Bradley? Lordy I am consumed with it and are starting to accept that partly it’s just in my genetic makeup, and the other part goes back to my childhood where I had no control over things that happened to me. I suppose I can honestly say I’ve never felt good enough at anything. Yet I’m capable of doing many things! I am my worst enemy. 🙂 I feel for you as I too don’t have a past I’m very proud of and I suppose that bothers me immensely. It is the past but in our minds it all still seems so very real. Bipolar is a strange thing to live with, right? I hug you and are glad someone like Maurice loves you so much that none of this matters to him. But I understand the feelings of guilt you feel. Sometimes I think we think we don’t deserve to be loved and are looking for reasons as to why someone actually cares about us. Then on some subconscious level we set about sabotaging the relationship. Paula, I think if you looked up self-sabotage in the dictionary you would see a picture of me. Big hugs back to you. This may sound like an arcane question, Bradley, but did either of your parents have behavioural traits suggestive of a narcissistic personality? My ex-wife of 19 years has expert-confirmed narcissistic personality traits, and she was always trying to make me fell guilty about… well, almost everything. Yet she was the perfect mother, a far superior parent than I was. At least, in her own mind she was. I’ve become a bit of a believer in psychoanalysis. I can’t help but wonder if your guilt isn’t a symptom of your current circumstances so much as an indicator of early exposure to narcissistic parental influences. Apology if this is too personal or gets into painful things. Wish nothing but wellness for you. No need to apologize, Nav. You should know from reading my posts that I am an open book. Growing up in my household was far from pleasant, but, I wouldn’t say either of my parents were narcissistic. There was just a constant craving to feel loved.